Will the new Subaru BRZ, the Toyota FR-S, and a coming new IS form Lexus influence Nissan’s 370Z line? Nissan has just announced model year 2013 pricing for the 370Z coupe, Roadster and NISMO 370 Z. When Nissan introduced its new generation of the 370Z coupe and roadster models a little over 3 years ago the vehicle was THE exciting new sports car in the marketplace. Redesigned, refined, and improved in almost every way, the Z was sure to turn heads and open wallets. Available in a surprisingly affordable coupe version, grand touring roadster version, and street fighter NISMO version, the car was a full line of fun. In just three short years the marketplace has changed and it will be interesting to see if Nissan can keep the 370Z selling with the new competitors now on the scene. Although not a direct competitor, the car that many shoppers in the marketplace for a 2-door sports car will check out in place of the 2013 Nissan 370Z is the Toyota/Subaru sports car just now hitting dealer lots. The Subaru BRZ is the closer of the two to the Z since it comes with a standard navigation system. Priced at just about $29,000 fully loaded, the BRZ tops out just under the starting point of the 370Z. The Nissan 370Z coupe in model year 2012 started at $ 33,580 with an automatic transmission. Both cars are somewhat cheaper (figure $1000) with a stick shift. Considering a 3 to 5 year financing scheme, or lease, there really is little difference in the monthly payments of these two cars. One reality for buyers is that finding a base 370Z may be near impossible – at least that was the case. For model year 2013 the price of the base unit 370Z will increase a bit to $34,420 with an automatic. Now that the price difference is fully five grand more, perhaps the new car buyer will look more closely at the Subaru or even the Toyota (which has no nav). 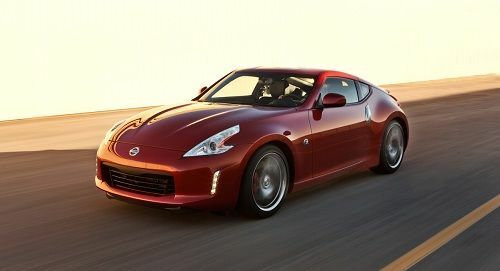 Nissan's 2013 370Z also has to contend with the new Lexus IS250 and IS350 and the convertible variants of that model. Although the Lexus is a 4-door, and although Infiniti has the G-series to compete with the Lexus IS, the truth is that Lexus is cross chopped against the Nissan 370Z by many buyers (including this author). The Lexus will likely cost more than the 370Z when it is refreshed late this fall and sold as a 2013, but it will also have more content. Currently, a base IS350 rear-wheel drive sedan starts at $40,220. The 2013 Nissan 370Z touring with an automatic transmission (which has equivalent content to the IS350) will be priced at $ 39,120.00. In actual fact, the Lexus will come with more added features driving the price up to about $43K. Still, the cars are comparable in price. Comparing the Lexus IS350C to the Nissan 370 roadster, the prices are again within about $3,000 of one another. Therefore, Nissan will see pressure from the spot just above it in the marketplace and also just below it. The squeeze could mean some deals for shoppers. Overall, prices for the 370Z increase about 3% across the board. For a full list of current 370Z prices with options please visit this link.